The original locomotive body as I received it from my friend. Take a look at the remarkable detail of this die cast body. It was almost too beautiful to paint! But I resisted the temptation not to. First the body got a thorough bath to degrease it. I put it in rather warm water with concentrated dish washing soap for half an hour. Then I cleaned it thoroughly with running warm water. Then I submerged the body in a warm bath with acetate in it for another half hour. During both cycles I scrubbed the body with a hard brush. After this you shouldn't touch the model with bare fingers anymore. Then I picked up the airbrush and did the base coat. I used Floquil primer. Here you can see the results of my first serious airbrush job ever. After a few days, allowing the base coat to dry, I set off to apply the first layer of blue. Finding the right color proved to be very difficult. Officially the E41 was fitted with RAL5011, Dark Sea Blue or Stahl Blau. In tables I found on the internet this should correspond with Revell 350, Tamiya XF17 or ModelMaster 1717. Choice enough, one should think. Well neither even approached the kind of blue the original color Märklin used. Then disaster struck. The Revell 350 paint just wouldn't settle straight. Instead of a nice smooth surface it had a grainy one. From a distance it looked okay, but taking a close look revealed this awkward grain effect. I decided to leave it and concentrate on the roof. Finding the right metal like gray as Märklin did, once again proved difficult. I bought several metallic, aluminum, iron, etc from Revell and ModelMaster and painted several test strips. At last I more or less desperately chose one metal paint, taped the body and sprayed the roof. I flung the body in a glass of thinner and left it there to rot for days. I removed the remains of the paint with a hard brush and started all over again. I reconsidered the blue paint. First a had to find color that wouldn't give that grainy effect. Second I had to find the right color, since all the Dark Sea Blue versions gave a more dark grayish green effect rather than a blue one. After long thought I decided to mix the paint myself. I bought a second body on a fair and bought the color nearest to the Märklin color. I bought a basic blue from ModelMaster that came close enough, 1772E "Blue Angel", and added quite some black, 1597E semi gloss black, until I had a color that though not completely yet closely matched the original. I also kept searching for a suited metal color and although it was on the shiny side I also found one, Humbrol 27001, metal aluminum. After the second attempt the body appeared in the beautiful dark blue that I achieved and which didn't differ much from the original paint. The aluminum. was too shiny but it was much better than the previous attempt. On this photo all the painting had been done. The conduits on the roof and the numbers on the side were done by hand with a very tiny brush. I used Revell SM331 for the red color of the conduits. The finish was not applied yet. After drying there was a bit of a surprise for me: the shiny roof had dimmed quite a lot incidentally coming very, very close to the original color. I didn't count on this and it was simple luck that helped me. It is also a warning for future projects: you don't have the color right until you have applied the finish coat!! Was it worth all the trouble, restoring a thirty year old locomotive that had already lost all its collectors value by the previous paint job? Well if you consider it from the collectors point of view: no. 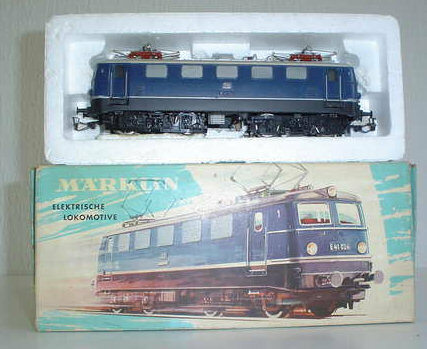 Although prices for a E41 in mint condition in original box may soar to 150 euro, the E41 is almost the most common Märklin locomotive, even today offered on eBay by dozens. Repainting the loco has completely destroyed it value. But from the owners point of view: yes. First there is the emotional value, it is after all the locomotive of your teenage years. Second this one time and unique E41 reappears in new, near original livery. And lastly from the painters point of view: I was totally inexperienced when I started the job and I have learned so many valuable lessons I would never have learned without the pressure of having to come up with at least a reasonable result.